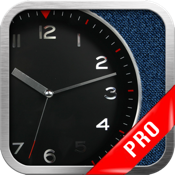 ChronoTimer Pro is the complete version of ChronoTimer that includes more features, but it still is intuitive to use and only displays the necessary information. -You can temporally save 3 different laps and know which was the fastest. -You choose when to start recording each lap. -You can temporally save 3 different laps, know which was the fastest and store in a database the total time and name of the recorded activity. -Each lap starts its recording immediately the previous one finishes. -Complete management of your activities database. *Share your records in Twitter and Facebook.